a October 8, 690 – Mairch 3, 705.
b December 16, 755 – Februar 17, 763. 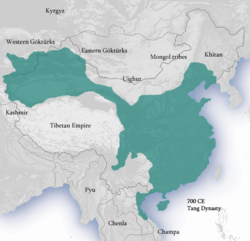 The Tang dynasty (Cheenese: 唐朝; pinyin: Táng Cháo; Wade–Giles: T'ang Ch'ao), wis an imperial dynasty o Cheenae precedit bi the Sui dynasty an follaed bi the Five Dynasties an Ten Kinricks period. Historians generally regaird the Tang as a heich pynt in Cheenese ceevilisation, an a gowden age o cosmopolitan cultur. Tang territory, acquired throu the militar campaigns o its early rulers, rivaled that o the Han dynasty. The Tang caipital at Chang'an (present-day Xi'an) wis the maist populous ceety in the warld in its day. The Lǐ faimily (李) foondit the dynasty, seizin pouer in the decline an collapse o the Sui Empire. The dynasty wis briefly interruptit whan Empress Wu Zetian seized the throne, proclaimin the Seicont Zhou dynasty (690–705) an acomin the anerly Cheenese empress regnant. In twa censuses o the 7t an 8t centuries, the Tang records estimatit the population bi nummer o registered hoosehauds at aboot 50 million fowk. Yet, even whan the central govrenment wis brakin doun an unable tae compile an accurate census o the population in the 9t century, it is estimatit that the population haed growed bi then tae aboot 80 million fowk. [lower-alpha 1] Wi its lairge population base, the dynasty wis able tae raise perfaisional an conscriptit airmies o hunders o thoosands o truips tae contend wi nomadic pouers in dominatin Inner Asie an the lucrative tred-routes alang the Silk Road. Various kinricks an states paid tribute tae the Tang coort, while the Tang an aw conquered or subdued several regions that it indirectly controlled throu a pertectorate seestem. Besides poleetical hegemony, the Tang an aw exertit a pouerfu cultural influence ower neeghboorin East Asie states sic as thae in Japan an Korea. The Tang dynasty wis lairgely a period o progress an stability in the first hauf o the dynasty's rule, till the An Lushan Rebellion an the decline o central authority in the later hauf o the dynasty. Lik the previous Sui dynasty, the Tang dynasty maintained a ceevil-service seestem bi recruitin scholar-offeecials throu staundartised examinations an recommendations tae office. The rise o regional militar govrenors kent as jiedushi in the 9t century unnermined this ceevil order. Cheenese cultur floorished an faur matured in the Tang era; it is tradeetionally conseedert the greatest age for Cheenese poetry. Twa o Cheenae's maist famous poets, Li Bai an Du Fu, belanged tae this age, as did mony famous penters sic as Han Gan, Zhang Xuan, an Zhou Fang. Scholarts o this period compiled a rich variety o historical leeteratur, as weel as encyclopaedias an geografical warks. The adoption o the teetle Tängri Qaghan bi the Tang Emperor Taizong in addeetion tae his teetle as emperor wis eastren Asie's first "simultaneous keengship". Mony notable innovations occurred unner the Tang, includin the development o widblock printing. Buddhism becam a major influence in Cheenese cultur, wi native Cheenese sects gainin prominence. Houiver, in the 840s the Emperor Wuzong o Tang enacted policies to persecute Buddhism, that subsequently declined in influence. Awtho the dynasty an central govrenment haed gane intae decline bi the 9t century, airt an cultur conteena'd tae floorish. The waikened central govrenment lairgely widrew frae managin the economy, but the kintra's mercantile affairs stayed intact an commercial trade conteena'd tae thrive regairdless. Houiver, agrarian rebellions in the latter hauf o the 9t century resultit in damagin atrocities sic as the Guangzhou massacre o 878–879. ↑ In the rule o the Tang the warld population grew frae aboot 190 million tae approximately 240 million, a difference o 50 million. See an aw medieval demografie. This page wis last eeditit on 2 Apryle 2019, at 02:07.